GAO-15-522T: Published: Apr 14, 2015. Publicly Released: Apr 14, 2015. 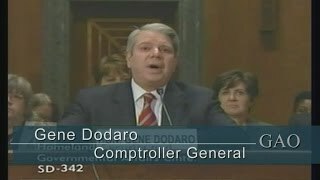 In his April 14, 2015 testimony to the U.S. Senate, Comptroller General Gene Dodaro introduces GAO's 2015 Duplication and Cost Savings Report. GAO's 2015 annual report identifies 66 new actions that executive branch agencies and Congress could take to improve the efficiency and effectiveness of government in 24 areas. GAO identifies 12 new areas in which there is evidence of fragmentation, overlap, or duplication. For example, GAO suggests that Congress repeal the statutorily required US Family Health Plan—a decades-old component of the Department of Defense's (DOD) Military Health System—because it duplicates the efforts of DOD's managed care support contractors by providing the same benefit to military beneficiaries. GAO also identifies 12 areas where opportunities exist either to reduce the cost of government operations or enhance revenue collections. For example, GAO suggests that Congress update the way Medicare has paid certain cancer hospitals since 1983, which could save about $500 million per year. The executive branch and Congress have made progress in addressing the approximately 440 actions government-wide that GAO identified in its past annual reports. Overall, as of March 6, 2015, 37 percent of these actions were addressed, 39 percent were partially addressed, and 20 percent were not addressed. Executive branch and congressional efforts to address these actions over the past 4 years have resulted in over $20 billion in financial benefits, with about $80 billion more in financial benefits anticipated in future years from these actions. Although progress has been made, fully addressing all the remaining actions identified in GAO's annual reports could lead to tens of billions of dollars of additional savings. aActions included in "consolidated or other" were not assessed due to subsequent events or new information that GAO considered. Addressing fragmentation, overlap, and duplication within the federal government is challenging due to, among other things, the lack of reliable budget and performance information. If fully and effectively implemented, the GPRA Modernization Act of 2010 and the Digital Accountability and Transparency Act of 2014 could help to improve performance and financial information. In addition, GAO has developed an evaluation and management guide (GAO-15-49SP), which is being released concurrently with the 2015 annual report. This guide provides a framework for analysts and decision makers to identify and evaluate instances of fragmentation, overlap and duplication and consider options for addressing or managing such instances. As the fiscal pressures facing the government continue, so too does the need for executive branch agencies and Congress to improve the efficiency and effectiveness of government programs and activities. Such opportunities exist throughout government. To bring these opportunities to light, Congress included a provision in statute for GAO to annually identify federal programs, agencies, offices, and initiatives (both within departments and government-wide) that are fragmented, overlapping, or duplicative. As part of this work, GAO also identifies additional opportunities to achieve cost savings or enhanced revenue collection. GAO's 2015 annual report is its fifth in this series (GAO-15-404SP). This statement discusses (1) new opportunities GAO identifies in its 2015 report; (2) the status of actions taken to address the opportunities GAO identified in its 2011-2014 reports; and (3) existing and new tools available to help executive branch agencies and Congress reduce or better manage fragmentation, overlap, and duplication. To identify what actions exist to address these issues and take advantage of opportunities for cost savings and enhanced revenues, GAO reviewed and updated prior work, including recommendations for executive action and matters for congressional consideration. For more information, contact Orice Williams Brown or A. Nicole Clowers at (202) 512-8678.